SSG Dustin Wright of the 3rd Special Forces Group was killed on Wednesday, October 4, 2017 in Niger as a result of hostile fire. He was a member of a U.S. Army Special Forces detachment conducting a reconnaissance patrol along with host nation military forces. The SF team and Nigerien troops were in southwestern Niger near the Mali border when they were attacked by a militant group of 50 plus fighters. Two other Soldiers were killed and two detachment members were wounded. The wounded were evacuated from Niger and transported to Landstuhl Regional Medical Center in Germany. Wright, age 29, was from Lyons, Georgia. He graduated from Toombs County High School in 2007. He was serving as a Special Forces Engineer Sergeant. His awards and decorations include the Joint Service Achievement Medal, Army Good Conduct Medal, National Defense Service Medal, Army Service Ribbon, Special Forces Tab, and Parachutist Badge. Funeral arrangements will be made by the Ronald V. Hall Funeral Home in Vidalia, Georgia. 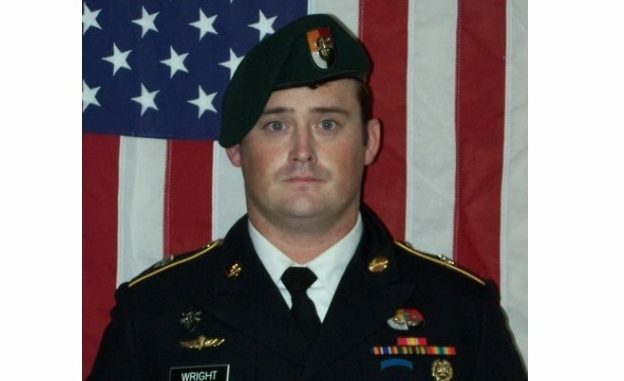 Toombs County Green Beret Killed in Africa, Southeast Georgia Today, October 5, 2017. Local U.S. Army Green Beret Killed in Africa, WTOC.com, October 5, 2017. Toombs County community remembers fallen Green Beret, WTCO.com, October 9, 2017.